I swear to you guys, I don't spend my entire life going to brunches, happy hours and parties with other bloggers. However, it really seems like it sometimes, doesn't it? We just have an understanding. A no-judgement-if-you-want-me-to-take-pictures-of-you-crossing-your-ankles-and-admiring-your-own-shoes understanding. Aside from that though, we style bloggers are really genial and fun-loving people, so why wouldn't we get together all the time and eat omlettes and/or drink $3 beers? Exactly. Hence we get together all the time. 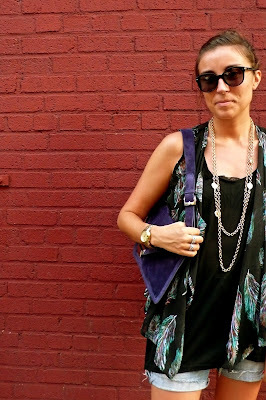 If you want to get technical, the transitive property proves that the more I socialize, the more outfit-y my blog gets. Just go with it. To that point, I met up with Sonia on Friday afternoon, just around the corner from my apartment, for a happy hour drink and some serious catch-up. We sat at the bar of this sort of random-but-cute-and-nicely-air-conditioned restaurant on 8th Avenue called Donnatella. The beer was cold, the conversation was lively, and then we took pictures. 7 for All Mankind jorts (cut from old bootcut jeans); H&M tank; Forever 21 vest (borrowed from Tully); Persol sunglasses (similar to these); Lyndi bag c/o Kooba; vintage necklaces; Urban Outfitters wedges. Michael Michael Kors watch (similar to this); Tiffany & vintage rings. gorgeous outfit - and even hotter photog...err just kidding...! Love the orange nail polish! Must copy asap. What brand & shade is it? Cute outfit, and I have to say, I LOVE LOVE LOVE the new blog header! cute outfit! I like the new header too!